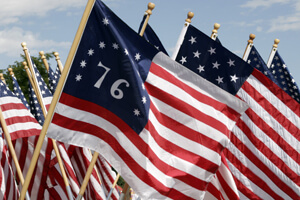 Today is the 35th anniversary of the Bicentennial 4th of July celebration of 1976. For those who weren't yet born in time for the Bicentennial, it's your loss if you weren't, because 1976 was the year ABC premiered "The Bionic Woman," "Laverne & Shirley" AND "Charlie's Angels," leading advocates for the advancement of women to declare that the entire gender had been set back 20 years. The Bicentennial was a big thing in America, as evidenced by the fact that it was spelled with a capital letter. It was as if the finales to "Dancing with the Stars," "American Idol," "The Biggest Loser," "Amazing Race" and "Celebrity Apprentice" were all held on the same day, except that Donald Trump's hair was still being assembled in the Philippines. I kind of missed the Bicentennial because I was marching my middle year as a drum corps member with the Cavaliers. But I remember there were parades—lots of parades. And, as we all know, all corps members love parades. There's something about traipsing down a hot asphalt street, heat waves searing the soles of one's shoes, sweat dripping down one's brow, marching past throngs of parade-watchers waiting for a Shriner riding a motorized miniature giraffe to throw some candy at the eager children. And that something is unprintable on this website. I'm not saying that people on the parade routes didn't then and don't now enjoy the drum corps; but more were there to see who was running for the office of county coroner and to learn who was crowned the Dandelion Festival Queen. So why did corps march so many parades back in the "Dark Ages," and why do so many still do so on the 4th of July? (Pick one of the following: A—Money, B—Money, C—Money.) Marching a series of 4th of July of July parades is an easy way to raise enough money to offset the interest on the loan the corps took out to buy or rent a second equipment truck to transport a fifth marimba. One of the parades the corps did on the Bicentennial 4th of July was in Brookfield, a western suburb of Chicago and home to the large Brookfield Zoo. As the equipment truck drove by in the parade behind the corps, spectators got to read the chalkboard on the side of the truck that read, "Happy 200th. Which way to the zoo?" It was one of those "you kind of had to be there" things. Members typically regarded parades as necessary evils. Most of us would have preferred to spend the time reinforcing the new drill changes or rotating our tires. Parades were tiring, hot, sweaty, sunburn provoking and thirst inducing, but there were also some negative elements as well. When the corps got naugahyde vests to wear over our old satin blouses in 1976, it was discovered during a 95-degree parade that naugahyde was a special material noted for not being one iota breathable. (Imagine wearing the red and white seat upholstery of a 1965 Corvette inside a Swedish sauna and you'll come close to the sensation.) The effect on the members was so bad that management ordered embroidered golf shirts for every member of the corps to wear in parades. We did so without our hats, enjoyed marching parades for perhaps the first time, and never again won a Best of Parade trophy. We didn't care. We were comfortable (and called ourselves The Casualaires). It was a good thing. Often, it seemed as if parades were the number one stimulant for brief-but-intense rainstorms. At a rainy parade in Aurora, Ill., the corps got dressed for the parade and boarded the buses, with instructions that we would be hopping out a block from the reviewing stand and would just march that segment before hopping back on the bus in order to keep our uniforms fairly dry for the show that night. To pass the time, we started singing bus songs out the windows as our buses traveled the parade route. And then we saw an interesting sight—the parade reviewing stand. We were still singing as we drove past the stand and realized someone had blown it. That night in the finale of the show, when the awards were handed out for the parade, we were shut out as expected. But, to our surprise, there was one additional award, and it was announced we won it. And to my knowledge, The Cavaliers are still the only corps to win the award for best choir in the Aurora parade. (The judges may have been fans of the music of Charles Ives, as all three busloads must have been singing something different as the buses drove by the reviewing stand.) I'm guessing there was a leftover parade plaque and the parade judges had a good sense of humor. And for that reason alone, I remember the Aurora parade. I remember very few other parades, except for realizing it's possible to create a festival for anything. For example, Empire, Mich. annually hosts the Empire Asparagus Festival in mid-May. The festival organizer claims, "Everything is asparagus-oriented." Well, that's enough to get me excited. I think the festival needs a parade since they already have an Empire Asparagus Festival Poetry Contest. Corps members could recite the winning poem while wearing this year's Cavaliers' guard costumes. Take a good look at the costumes and you'll see it won't take much to turn the creations into spears of asparagus. If the guard gets knocked down in score due to the costumes, it can only be because the judge is asparagusphobic. Either that, or the judge is Kimberlee Johnson, first place winner of this year's Empire Asparagus Festival Poetry Contest for her psychological thriller, "Asparagus: 21st Century Michigander." The poem commences as such: "Ever-stoic asparagus, with stalks as tenacious and resilient as the Michigan soul,/With emerald reaching to break through stubbornly persistent opaque clouds,/Patience is thy virtue." The poem goes on to discuss yearning, piercing the soil and the caressing of curved tips of lavender and violet. I personally think it's too graphic for a family website. I also think Ms. Johnson needs to march a few 4th of July parades—in a naugahyde corps uniform.